The GlobeTrotter S Carbon Fiber Travel Tripod from MeFOTO is a four-section support with carbon fiber legs and titanium anodized-aluminum twist locks that are knurled for a comfortable grip while opening and closing the locks. 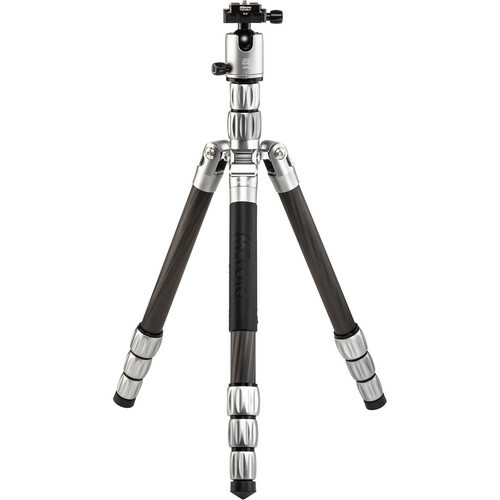 By extending the legs and the two-section center column, the 3.5 lb tripod can reach a maximum height of 61.6" and closes to a minimum height of 15.7". The legs fold in the reverse, so it can be carried to another location, and the removable center column and tripod leg combine to a full-working monopod. The Arca-type compatible ball head has a load capacity of 26.5 lb and includes a quick release plate with a 1/4"-20 camera mounting thread. Box Dimensions (LxWxH) 17.3 x 4.7 x 4.6"
GlobeTrotter S Carbon Fiber Travel Tripod (Titanium) is rated 3.8 out of 5 by 4. Rated 4 out of 5 by Tom from Very Nice Travel Tripod for the Price Excellently designed tripod that folds to small size and fits in carry-on camera bag or luggage. I already own a RRS heavy-duty tripod but it is too large and heavy in some situations so this smaller, lighter weight design is good. It supports my D750 with 24-70 lens. With a larger lens like a 70-200 it is a good idea to use the hook to attach some weight to help support the extra weight. Overall it is well made and I am quite satisfied with the purchase. Rated 3 out of 5 by Tyzenhouse from Clever design, but too short for me What i liked: It's compact and relatively light weight and converting one leg and the center post to a monopod is a clever design feature. What i didn't, and why i returned it: I am 5'9" and the tripod and especially the monopod mode did not give me enough reach to shoot upwards without crouching down into an uncomfortable position, especially for tracking wildlife in trees. Rated 3 out of 5 by stephanie from A bit on the light side for what I wanted I was wanting a sturdy carbon fiber tripod for my obsession of night photography. Unfortunately, although I do like this tripod with its easy setup/takedown, compact feature, I have decided to return it. for what I shoot, it requires a more stable tripod that wouldnt need weight on the weight hook. Otherwise, it would have been perfect! Rated 5 out of 5 by Sally from Handy-Dandy I have several tripods in my closet--good ones. But I was looking for something small, compact and sturdy for travel. I think I will be very pleased with this one . What is the difference between the manfoto globetrotter classic and manfoto globtrotter s?